Only a couple of seconds separated Kenyan runner Lawrence Cherono and Ethiopian Lelisa Desisa as they sprinted down the final stretch of Bolyston Street at the end of Monday's 123rd Boston Marathon. 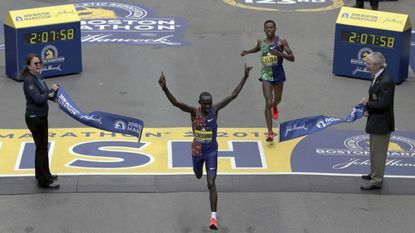 Degefa's winning time of 2:23:31 was 42 seconds better than Edna Kiplagat of Kenya, who finished second. The 20-year-old is the first American since 1993 to claim the title, and the youngest ever to win in the category. Degefa led the elite women's runners throughout the 26.2 mile race, at times pushing more than five minutes ahead of her competitors, according to announcers. The one-second margin of victory was the race's closest finish since 1988 with Cherono clocking an unofficial 2:07:59 and Desisa clocking a 2:08:00. She added that she plans to race in the Chicago Marathon in October.